I was starting to wonder if I could face another salad – can I keep the magic going? This little number comes from How Sweet It Is, which is a daily obsession. Jessica is always coming up with the tastiest dishes and she is also completely adorable. 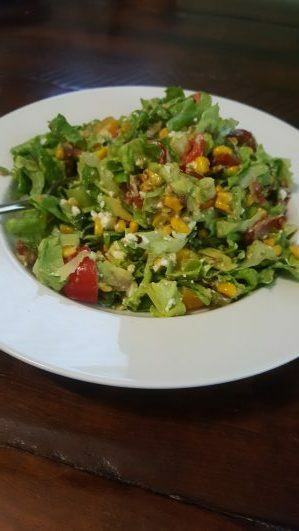 There is everything to love about this BLT Salad – bacon, fresh corn, grape tomatoes, feta (to be honest, I ran out of feta and used goat cheese), but besides that, we followed this recipe to the letter. And we were greatly rewarded. Go make this with someone you love. Seriously, these salads keep getting better! Totally lifted from Jessica at How Sweet It Is. As a note, to chop my lettuce I like to lay it out on a big cutting board and just continuously run my knife through it (in all different directions) until it’s chopped as much as I like. In a large bowl, combine lettuce, arugula, tomatoes, corn and avocado. Add in salt, pepper, olive oil and lime juice then toss well to coat. Fold in bacon and feta then divide evenly amount 2 plates. Serve! That Jessica knows her stuff. And for extra inspiration, go visit my girl and fellow co-founder at Atlanta Movie Tours, Carrie, at her blog, Cre8iveone, where she is slaying it! So proud. Go, visit, leave a very sweet comment.